Installing a pool in your backyard and the surrounding swimming pool landscaping will undoubtedly boost the value of your property. 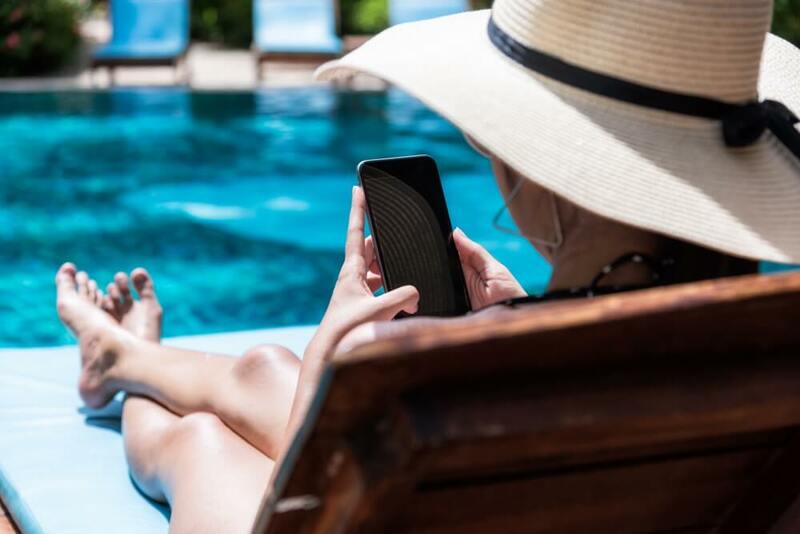 Checking with your local real estate agent about just how much more a property with pool landscaping will sell for in your area, compared to one without, will give you an idea of its potential. Added to the increased value factor of a private swimming pool is the fact that you will gain a beautiful and useful centrepiece for your backyard, which will act as the focal point of your entertaining and fun activities for the family for as long as you stay in the home. However, if you do intend to sell, or just want to increase the value of your property through pool landscaping, it’s important to go about it the right way. The first, and possibly the most important aspect is the planning stage. In this article, we intend to give you some easy steps to help you plan your backyard swimming pool landscaping, so you gain a distinctive hub for your family’s entertainment as well as add potentially thousands to the value of your house. Work out your available budget first and then work around this as your basis. Determine what you and your family need from the pool area (relaxation spot, exercise, entertaining guests) and then decide how you will achieve these goals with the budget that you have available. Be sure to include all extras in the landscaping in your budget, including the cost of heating, ongoing maintenance, pool lighting and the type of tiles you want to have. Ordering the goals is an excellent step, as your budget may not stretch to being able to achieve them all. Don’t forget to price pool fencing! This is compulsory and it must adhere to the Australian Standard AS 1926. Check with your local council for more details. How much space is available for the pool landscaping? And is that space flat ground or sloping? These are all factors that will determine the size, shape and even the type of pool that you eventually decide upon. Talk with your local pool installers for a better idea of what type of pool would suit the project. It is recommended that you include factors such as the space available and quality of land at the start of the project as this will have a big impact on your budget for the pool landscaping project. Do you have a backyard that will suit the building of an extensive pool landscaping project? Is the designated area level and easily accessible for pool installers’ machinery? For example, a crane will be needed to lower a large fibreglass pool into position before installation can begin. Therefore access to the backyard must be available for the machinery to lower the pool into place. If you do not have easy access, it may be necessary to consider a concrete pool (and adjust your budget up accordingly). One of the keys to success in pool landscaping is being able to coordinate contractors to complete their work in time for the next tradespeople to start theirs. Thus the project keeps moving smoothly. For example, first employ pool installers, then tilers to pave the pool area. A good tip is to book the contractors in the cooler months when work for the type of swimming pool landscaping is less in demand. This means you won’t have to wait around until a contractor is available during the busy summer season to complete work. Working out the order of jobs to be done is just as important. Here it is advisable to talk to your pool professionals to suggest ways to make this as seamless as possible. They may also be able to recommend contractors who they have worked with previously and can trust their quality of work and professionalism. Once you properly understand your budget, space, and needs of your family for the swimming pool and surrounds, it’s time to do the research. The Internet is a wonderful resource and a great place to start looking for ideas to adapt for your own landscaping. Image-centred social media sites such as Pinterest and Instagram are an excellent place to start your research. Pinch some ideas from home and garden sites and don’t be afraid to pop your head over the backyard fence of those in your neighbourhood who have pools—with permission of course. Perhaps ask them the challenges they faced and if any added costs are involved. 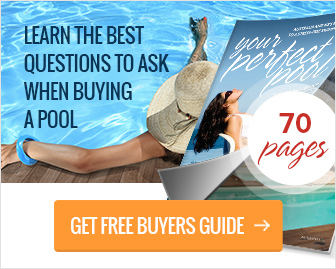 Check magazines, home improvement pages, and blog sites to find out the latest trends in pool designs. Most of all contact pool installers to get their opinion. They are experienced and knowledgeable about what can be achieved and will be able to assess the land and space available. The pool specialists will help you by suggesting designs and pool types that will suit your area and enable you to stay within budget. Having done the research, narrow down a few designs and types of pool that you believe will work in your backyard area and match it to your budget and needs. While concrete pools, for example, will give you greater design flexibility, they are almost twice as expensive as fibreglass pools and can sometimes take months before they are ready for use. 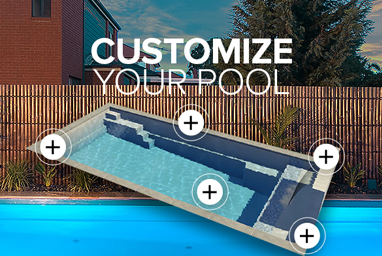 In contrast, fibreglass pools are affordable and ready within weeks. Ensure that the pool designs that you have chosen match the house style. If you live in a house that is a modern design, try and match the pool landscaping to complement the architecture. This may include clean lines, modern matching furniture, and tiling to suit the decor. However traditional rockeries and poolside gardens may be more suited to an older style of architecture. The pool landscaping is as important as the pool itself because it will act as the main relaxation and entertainment area. However, try and be a bit individual for best effect. Use other people’s ideas and advice as the basis for your pool landscaping but don’t be afraid to give it your own individual twist! Having worked out the budget for the project, as well as the available space, now it’s time to work within these parameters to get creative. With the right pool landscaping and type of pool, your backyard will be the hub of your entertainment and fun activities for family, friends, and guests. However, if done the correct way, pool landscaping will also add thousands to the value of your property. 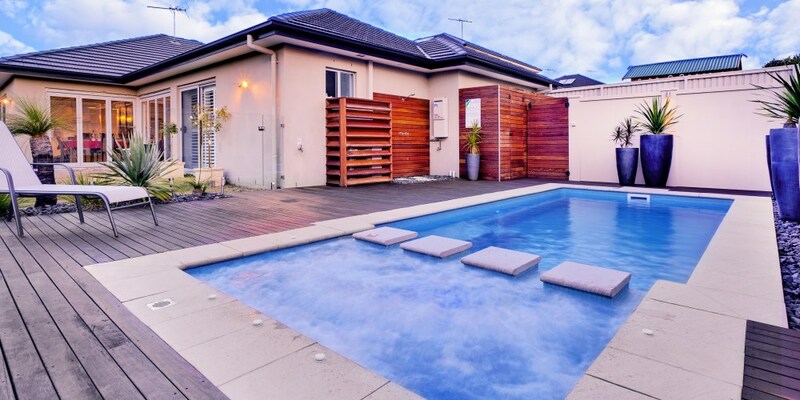 A 2014 survey conducted by the real estate information site realestate.com.au found that the search term “pool” ranked highest on all terms used by house hunters on the site. This ahead of “waterfront” “living areas” and “granny flat”. While it makes sense to consider adding a pool entertainment area to your backyard, it also requires careful planning and consideration as detailed above. Doing this the right way and early may save you thousands of dollars, a great deal of time and considerable heartbreak, particularly if you need to go back and revisit your original budget. Interested in hearing more about the best way to go about planning your landscaping ideas? 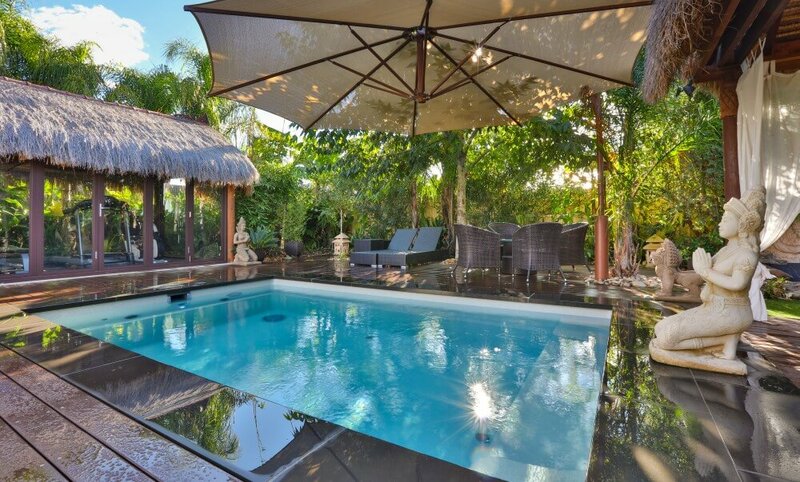 Wondering about the cost options and differences of various types of pool? Our friendly team are happy to talk to your to discuss everything you need to know about building your dream pool entertainment area. Contact us and talk with our experts today. PreviousPrevious post:How long does it take to build a pool?NextNext post:What are the alternatives to swim spas?